The term “conure” includes a number of small to medium-sized parrots (i.e. genera Aratinga, Pyrrhura, Cyanoliseus and Nandayus) found from Mexico to southern South America. While not necessarily closely related, aviculturists lump them together for convenience sake. North America’s Carolina parakeet, closely related to Aratinga, would likely have been considered a “conure” had it not been hunted to extinction in the early 1900’s. Nearly all accounts of conures include the word “clown”. Having observed flocks of conures in the wild and worked with others in huge outdoor exhibits, I can vouch that this description is most appropriate…they are among the most active and engaging of all parrots. Many popular pet conures belong to the genus Aratinga, which means “little macaw”. Certainly they have outsized personalities, and “act” as though they are as large as macaws – if anything, they are even more boisterous. The genus Pyrrhura is comprised of conures that, while more somberly colored than their relatives, are never-the-less quite beautiful. Their personalities are also subdued, exhibiting the intelligence of the Aratinga without the noise. Many make wonderful, affectionate pets. Other parrot genera contain species that are usually referred to as conures as well. Of these, the Nanday Conure (Nandayus nanday) and the Patagonian Cconure (Cyanoliseus patagonus) are popularly kept as pets. This largest of all conures is also one of the most unusual. It excavates nesting burrows of 6-9 feet in length in the sides of limestone or sandstone cliffs, usually overlooking the sea or a river. Patagonian Conures nest colonially, and the burrows may interconnect with each another, reminding one more of a rabbit warren than a parrot-nesting area! As there is usually no “landing area” in front of the cliff-side nests, Patagonian Conures fold their wings as they near and enter directly from the air, running as they hit the ground. Patagonian Conures are now rare over much of their range (south-central Argentina and Chile; possibly Uruguay), but they rebound rapidly when protected; despite laying only 2-3 eggs, their inaccessible nest sites and communal breeding system assures that most nestlings survive. I was very fortunate to have had the opportunity to work with a flock of Patagonian Conures in a huge outdoor exhibit, complete with nesting burrows, at the Bronx Zoo. I must say that these birds were perhaps the most interesting of any I have ever worked with – they literally do not stop interacting all day. Seeing parrots like this, or in the wild, really helps to give one a sense of their true natures, and to explain some of the problems they face as captives. I also helped to hand-rear 6 chicks, all of which became quite popular in outreach and educational programs. Patagonian Conures are quite a handful in the home, vocalizing often and at high volume. They are highly social, even by parrot standards, and remain in a close-knit flock even during the breeding season. Pets therefore require a great deal of attention and stimulation. That being said, their popularity is increasing…exceptionally responsive and entertaining, they are wonderful pets for those with appropriate time, experience and space. Please see my article on Half Moon Conures and False Vampire Bats for a peek at an odd bit of conure natural history. Parrots use a wide range of postures when communicating with one another and with their owners. Understanding the meaning of your parrot’s body language will simplify interactions with your pet, and is also important in assessing its health. Today we’ll look at puffed feathers – a behavior which can have several very different meanings, and so must be judged in the context of the surrounding circumstances. Parrots, and all birds for that matter, puff up their feathers in an effort to keep warm. The layer of air trapped within the feathers and warmed by the parrot’s body provides amazingly effective insulation. If you watch native birds during cold weather, you can readily observe this behavior. A bird’s internal temperature is much higher than our own, averaging 106-110 F, and so many species (but only a few parrots!) easily tolerate frigid weather. Puffed feathers can, oddly enough, also indicate that your parrot is too warm. In this case, the feathers may be flared to a greater degree than when cold temperatures are involved, and the wings may be held out a bit from the body. When very hot, the parrot may open its beak and pump the throat rapidly, a behavior known as gular flapping. Like many animals, parrots that feel threatened will attempt to make themselves appear larger…flaring their feathers and sometimes spreading the wings. 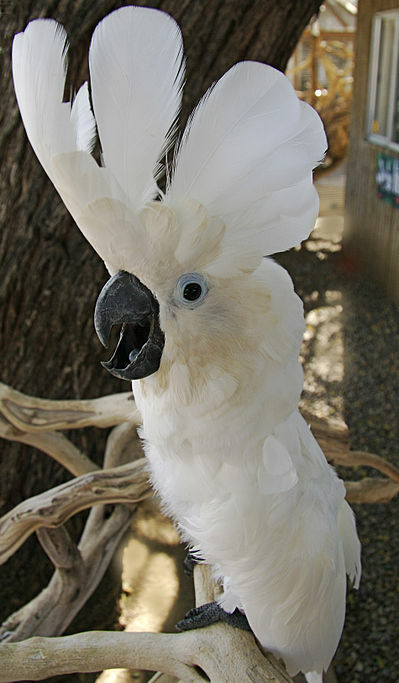 The head feathers may be raised quite high, even among species without crests (the “head display kings” are the cockatoos and hawk headed parrots; please see photo). Aggressive parrots will also stare at the threat – you may notice the eye’s pupil widening as well – and may snap their beaks or scream. A normally friendly bird that suddenly begins exhibiting this behavior, especially if it does so as you approach, may be masking an injury. Anticipating pain, the bird is warning you off and so should be checked carefully. Sudden aggression may also arise as a result of hormonal changes associated with sexual maturity, or because the bird is jealous of attention being given its favorite person by another pet or individual. Sick or injured parrots, and females having difficulty passing eggs, will sit, sometimes on the cage floor, with their feathers puffed out and the body held in a “hunched” position. The eyes may be closed or partially closed as well. As it is in a bird’s “best interests” to hide any symptoms of illness (predators single out sick and injured individuals as prey), parrots exhibiting such dramatic signs of illness should be seen by a veterinarian right away. Parrot sounds also convey a great deal of information; to learn more, please see my article What is My Parrot Saying?